I’m pretty sure cookie dough has officially become a food group in my diet. There is just something about the chewy, creamy texture that I am allllll about. 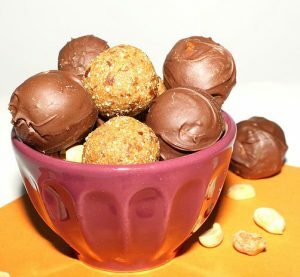 Not to mention the bonus that cookie dough is raw, so you can whip it up in a few minutes and you don’t even have to turn on the oven. 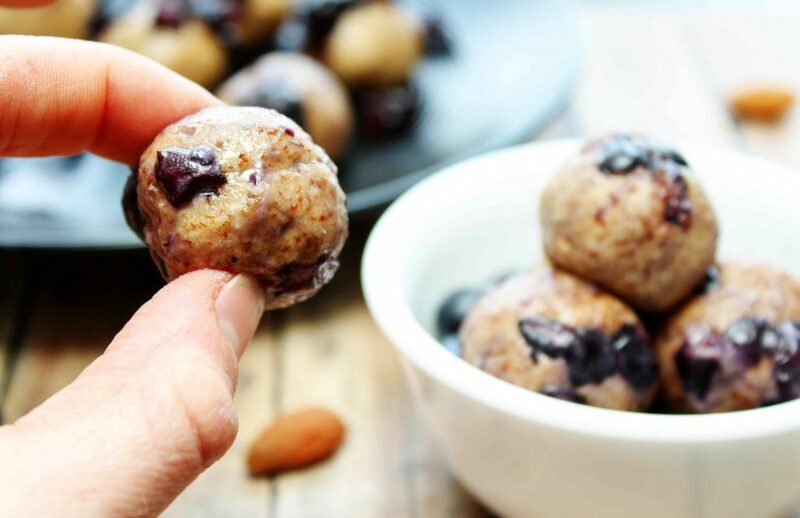 Make it a healthy cookie dough = HEAVEN! 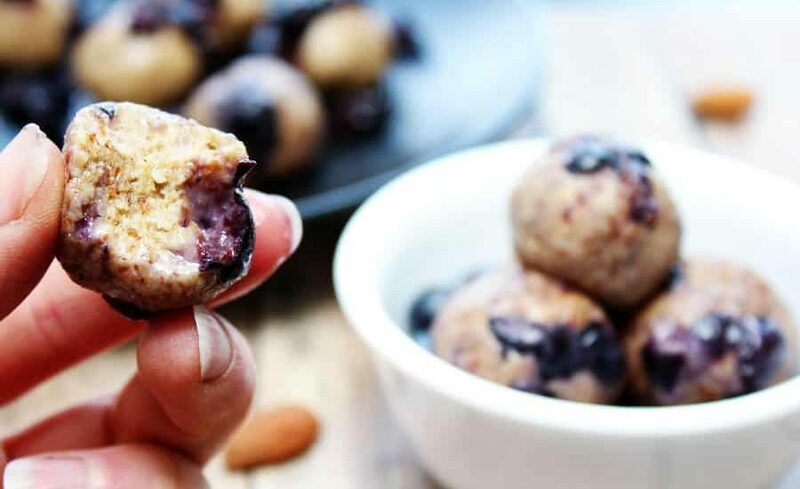 And lemme tell ya, these blueberry cookie dough protein energy bites are little delicious, chewy pieces of heaven. 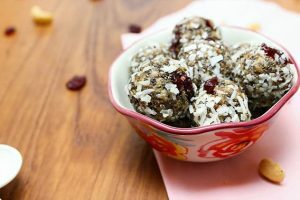 On their own, these energy bites are addicting, but throw in the bluebs and you get that perfect extra punch of sweet tartness. 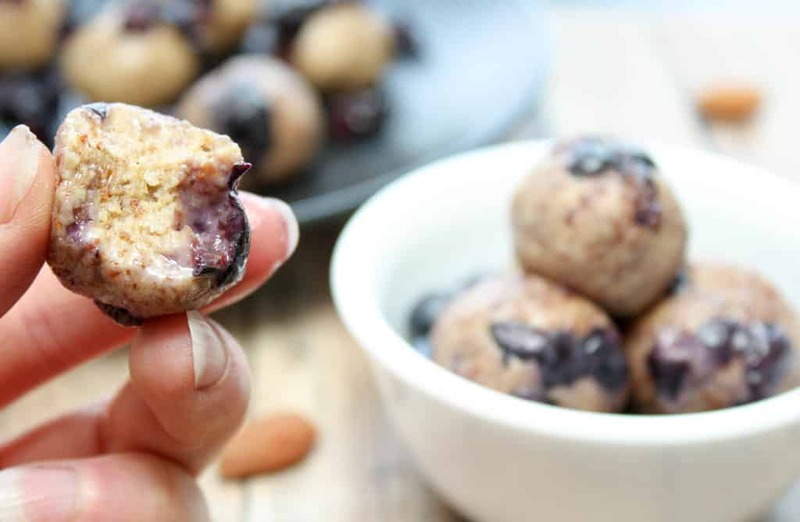 Growing up, blueberry muffins were always my favorite type of muffin, so I wanted these bites to be a little reminiscent of those. And why not! 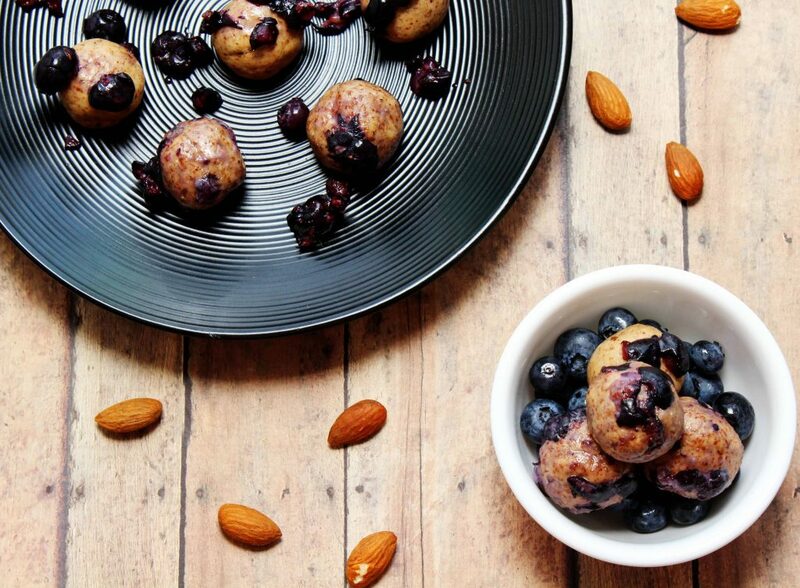 There is a good reason why blueberries have become known as a superfood. These little gems promote healthy digestion, are loaded with antioxidants – which can help fight off cancer, and even help prevent wrinkles thanks to their high vitamin C content. Also, if you want to get the most blueb bang for your energy bite buck, I found it was best to use chopped pieces of blueberries instead of whole ones. I also found it was a bit difficult to roll the bites into, well, bite size with the whole berries in the dough. But don’t fret! I’m not going to tell you to meticulously chop already tiny blueberries into even tiiiinier pieces. Instead, my quick and easy trick is to throw them in a food processor and pulse 2-3 times. Wah-lah! Blueberry pieces! 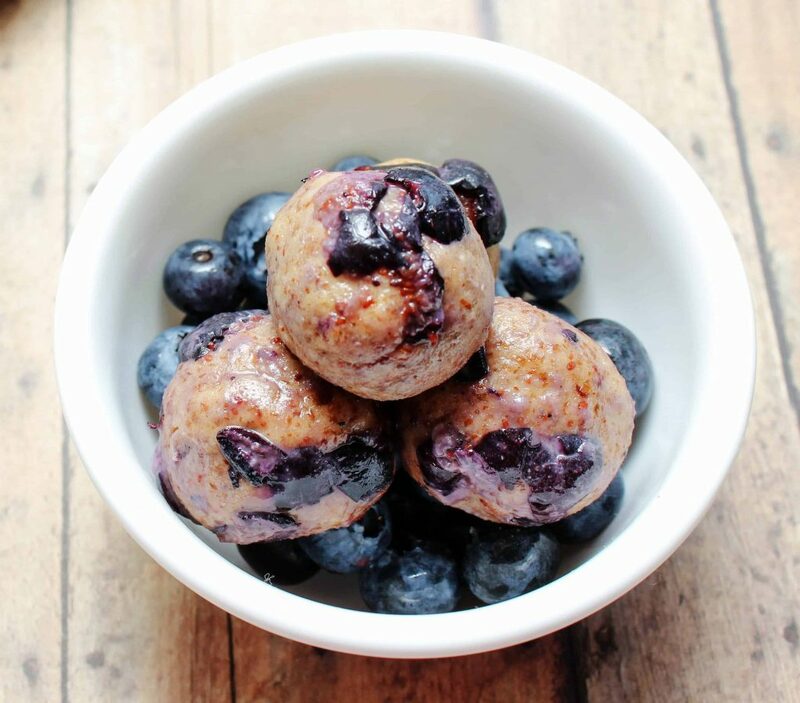 complex carbs – in the dates and, of course, BLUEBERRIES! Another reason why I love these bites is because they are so easy to grab-and-go-that they have been my afternoon snack for the past few days now. So, if you’re after an easy sweet treat (that is also refined sugar-free, btw), whip these blue beauties up tonight! Place all ingredients, except the blueberries, in a food processor or blender. Blend together until all ingredients are combined and forms a dough-like ball. Remove the dough from the food processor/blender and place into a medium sized mixing bowl. Place the blueberries in the food processor/blender and pulse 2-3 times to get small pieces. Fold the chipped blueberries into the dough. Roll the dough into 11 equal sized balls (will be about 1"). Enjoy those bite sized treats!